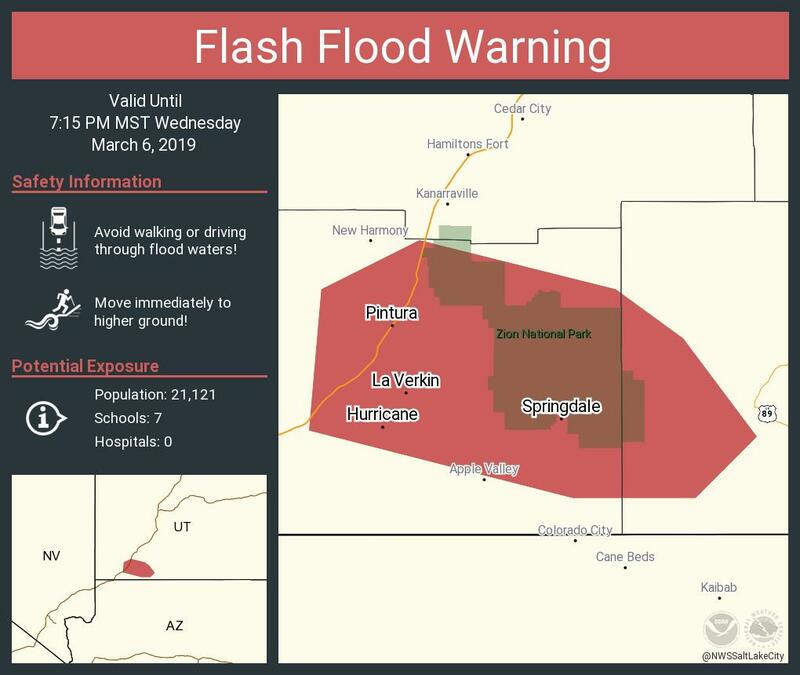 ST. GEORGE — The National Weather Service in Salt Lake City has issued a flash flood warning for the southeastern area of Washington County and a portion of Kane County until 7:15 p.m. Wednesday. In addition, a winter weather advisory is forecasting as much as 2 feet of snow through the higher elevations of the majority of the state along the I-15 corridor. Rainfall of 3/4 to 1 inch is expected to fall over the area Wednesday afternoon and early evening. Due to the amount of rainfall, the following areas are susceptible to flooding: Hurricane, LaVerkin, Zion National Park, Toquerville, Leeds, Virgin, Springdale, Rockville, Pintura and Kolob Canyon. Officials are urging people to avoid any waterways in and around Zion National Park, as conditions will be dangerous for traveling, hiking, canyoneering and other outdoor activities. Park officials officially closed The Narrows and all slot canyons until two hours after the flood warning has been lifted and said The Narrows will not reopen until flow is below 150 cubic feet per second for a 24-hour period. 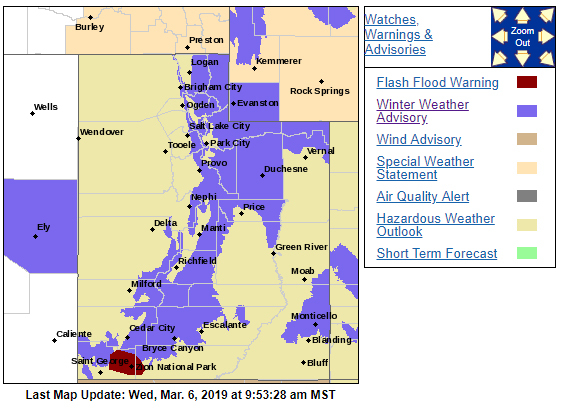 In addition, the winter weather advisory has predicted anywhere from 6-18 inches of snow in higher elevations, primarily above 8,000 feet, until 10 a.m. Thursday. Southwest slopes may locally see in excess of 2 feet of snow. Mid-elevation winds are expected to gust as high as 50 mph, especially south of I-70. Winter driving conditions are expected, especially above 8,000 feet, though at times as low as 7,000 feet. Gusty winds may cause blowing and drifting snow, locally reducing visibilities to near zero. The heavy snow and winds may down large tree branches. In hilly terrain there are hundreds of washes and low-water crossings that are potentially dangerous in heavy rain. Do not attempt to cross flooded roads. Find an alternate route. During any flood emergency, stay tuned to official weather reports via radio, television and social media. Cell phone users can also sign up to receive weather alerts as text messages. 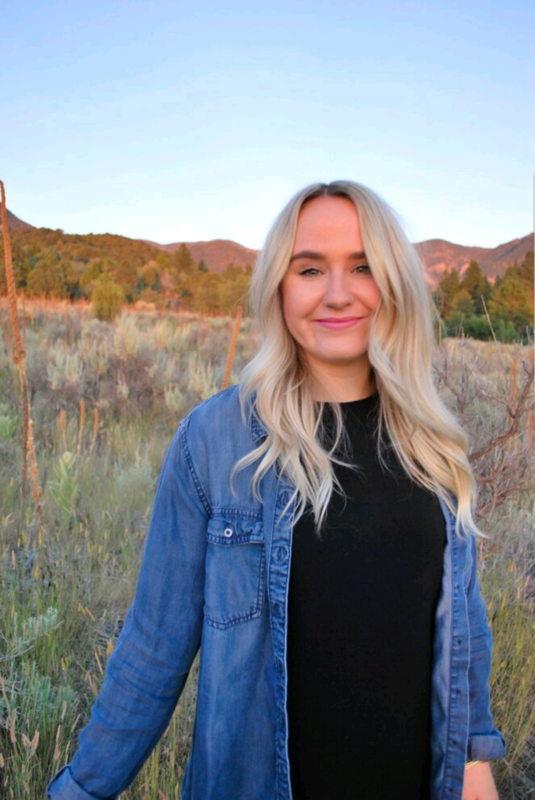 You can also follow St. George News and Cedar City News for weather alerts and updates relevant to Southern Utah. For the most current conditions, warnings and advisories, go to the National Weather Service-Salt Lake City office website. Additional information on winter driving can be found at the UDOT website, as well as UDOT’s Commuterlink for current road and weather conditions, or dial 511.